I knew when I married the man that I married the mansion. 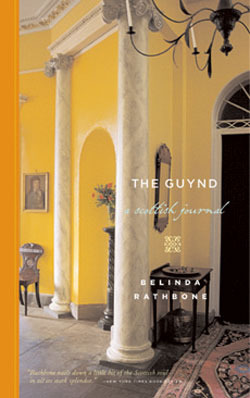 On Rick Steve’s recommendation (in a UK guide book) I read Belinda Rathbone’s memoir The Guynd (rhymes with the wind). It is a poignant account of an American woman who marries a modern Scottish Laird. Does this sound romantic? The stuff of Jane Austen, Robert Louis Stevenson, or the Brontë sisters? Their quirky courtship is more dalliance than alliance. When she married the laird, he offered her the land. But the Guynd is not Pemberley; no servants dusted and hoovered the carpets. “I had left Mansfield Park and entered Bleak House.” Overwhelming effort is required to restore the run-down Georgian house and 400-acre estate. But “the Lady” has determination and energy and good taste. When they roll up the brown linoleum that was put down during WWII her spirits pick up the promise of more dramatic change. Anyone interested in interior decorating will join in the excitement. Photos here. I had no experience with rooms of these proportions or with architecture of this gravity. Small gestures were lost in the spaces, but large gestures were all the more daunting. Different sensibilities and priorities create tension between John and Belinda. The story begins with a crumbling mansion and ends, sadly, with a decaying marriage. Belinda writes exceedingly well of modern Scotland: landowner-tenant relationships, tea rituals, famous frugality, education, sense of time, and the bitter cold. So one learns to appreciate the native frugality within the context of generations upon generations of people born to poverty, and understand why the Scots might be inordinately grateful for small things and careful with what they have. When times are hard the Scots are better prepared for them than most of us, for a life of hardship is never buried too deep in the Scottish memory. It was an easy/hard read. For the portrait of Scotland, and the well-crafted prose, it was engaging, winsome, even charming. For the heart-ache and depleted spirit, the seeming futility and failure of restoration and of relationship, it was depressing. Marriage is like a house, I thought, staring up at a crack in the bedroom ceiling. It’s a shelter, first of all. And it needs to be kept in good repair. Signs of water seeping through the wall need to be investigated before the paint begins to flake off, a bare patch is exposed, the fabric begins to crack, and the job of fixing it is too discouraging, too expensive, simply the last thing you can be bothered to do. This entry was posted in Uncategorized and tagged bookreview, quotes, Scotland by alivingpencil. Bookmark the permalink. Good review! I love Scotland and its history, and it sounds like Rathbone paints a neat picture of that country. Sad that the marriage decayed, though. Great review. I read this book last fall and felt much the same way about it. I kept longing for them to find a way to dig out from under the physical and emotional layers to restore to beauty what they had been given. I’m glad I read the book, but so sorry for the people who lived in such poverty of spirit. @the Ink Slinger – @LaJuana – @jackug – Thank you!